Open to the public. We host kids ages 4+ for a night of games, pizza and an age appropriate movie. Often giving parents a little break for some downtime or a date-night. No Karate experience necessary - all are welcome. Available to kids and adults! We host your party for two hours providing karate inspired games and activities, food, beverages, sword cake cutting (cake not provided), standard decorations, paper products and karate party bags. Customization to any party is available. Please inquire for more details. Adjunct weapons training is provided to those students who desire it. Common weapons are Bo Staff, Nunchuk, Broadsword, Tai Chi Sword. Training can be provided through private instruction or special Master's Seminars. Special events that are unique learning opportunities from a Master of the the arts. weapons training is provided to those students who desire it. Common weapons are Bo Staff, Nunchuk, Broadsword, Tai Chi Sword. Training can be provided through private instruction or special Master's Seminars. Tournaments represent the sport of the martial arts. Participation teaches the students to be able to face their fears of being seen and judged in a public place. As their focus and skills are tested in front of respected judges, family and peers, their confidence and self-respect are boosted. The first tournament is always the hardest, but each subsequent competition reinforces focus, comradery, and winning and losing with the proper attitude and good sportsmanship. It can be a real test of one's inner self. For children, it teaches them to do their best, to have fun and to respect the outcome. The teens are great role models for the younger competitors. They enjoy each other’s victories and losses without any reservation. Adults have as much, if not more, fun than the teens once they get over their initial fears. For the instructors, seeing all the students grow with their families and friends cheering them on is incredible. There are many life lessons in competition. Villari’s conducts these tournaments as an opportunity for students from all Villari’s schools to meet in a spirit of fun and friendly competition, where winning is in simply competing. Sparring is a form of training common to many martial arts. Although the precise form varies, it is essentially relatively 'free-form' fighting, with enough rules, customs, or agreements to make injuries unlikely. In martial arts sparring, one exhibits all the same physical offensive and defensive moves as in a real fight, except without trying to inflict harm. In competition there are rules and target areas to strike at with control to win by cumulative points. In many ways Sparring resembles a game of tag. The object is to score a point to a legal target area. A point is scored when a punch or kick is thrown toward a legal target area on the opponent. Legal target areas include: Front of the body from belt to top of head, sides of body and head, and back of head. No points are scored to the back of the body or below the belt. Discretion is used according to rank as to the degree of precision and control needed to score a point. 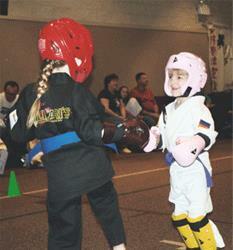 Parents are encouraged to outfit their children with a complete set of foam sparring gear. Foam gear is worn only to protect against accidental contact, not to encourage contact. Forms consist of Pinons and Katas. Pinon (Pinion) translates to standing restraints and ground immobilizations. Kata translates to formalized exercises or, set routines of movement both offensive and defensive against imaginary attackers. In real life, Pinons and Kata's are extremely useful because they can be made to reflect authentic contemporary fighting situations, but by themselves they are not enough to create an effective fighter. Kata's develop speed, coordination, balance, power and precision. They can improve technique, build endurance and occupy a center of the mind that can create an active state of meditation. Judges give a score based on : Balance, Precision, Power, Concentration and Spirit. All forms are judged on an individual basis according to rank, not against the other competitors. In this manner, all competitors have an equal chance of winning. Some students put together martial art skits to music and/or perform with martial arts weapons. These demonstrations are often thrilling for others to see. They provide a creative outlet for the participating students. Although your events will only be a portion of the day, we encourage you to come early and stay later to see some of the other events and age groups compete. Watching other events can be almost as much of a learning experience as actually competing!